Patients at Very High Risk of developing pressure ulcers are frequently nursed on air mattresses. They are expensive and uncomfortable. A six month clinical trial was conducted at Eastbourne NHS Hospital Trust to confirm the efficiency of the Thermocontour mattress. Ward A with a mixture of 24 static and air mattresses, was compared with 24 Thermocontour mattresses in adjacent ward B. Hundreds of patients were monitored regularly on both wards over a 6 month period. 1. Ward A. ﻿A mixture of 18 static mattresses and 6 air mattresses. 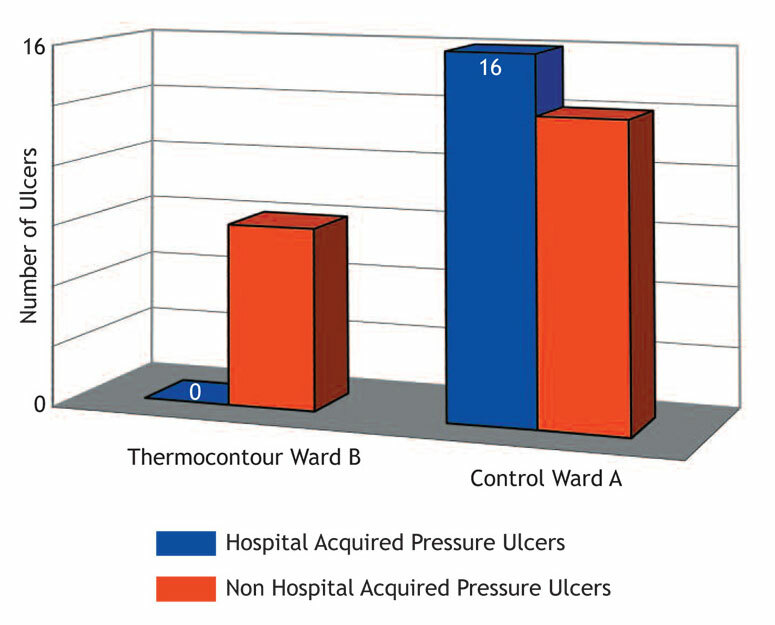 16 hospital acquired pressure ulcers were recorded on patients at Very High Risk (Waterlow Scale 25+). 2. Ward B. ﻿24 Thermocontour mattresses. Of 407 patients, 81 were in the Very High Risk category (Waterlow Scale 25+). None developed pressure ulcers. Many reported excellent comfort. Designed to prevent hospital acquired pressure ulcers. Thermocontour products, made in Denmark have been through extensive clinical testing in busy hospitals over the past 18 years in Europe, Middle East, Japan, Australia and New Zealand.